In this episode, Yahnathan continues his discussion with life coach and author Tocha Moore by addressing the question: What are ways to effectively communicate with our Heavenly Father? 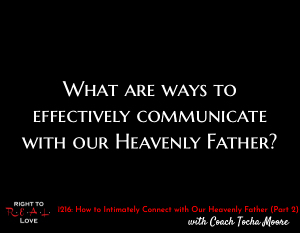 What are ways to effectively communicate with our Heavenly Father? Drawbacks of having one-sided conversations with Yah/God. Different ways Yah/God may speak to you. Tocha shares how her daily evaluations have been helping her to develop intimacy with Yah. Yahnathan shares how valuable reflexive prayer has been in helping him develop intimacy with Yah.